In response to the recent devastating storms throughout our region, Rock/Creek and KEEN have joined forces to raise money in support of disaster-relief efforts. 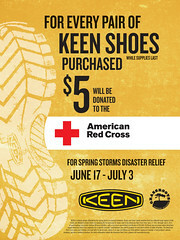 For every pair of KEEN sandals or KEEN shoes purchased at Rock/Creek from June 17, 2011 to July 3, 2011, KEEN will donate $5 to the American Red Cross on behalf of disaster relief and recovery efforts. “KEEN strives to be a company with a conscience, a company that makes a difference by giving back to the greater community,” said Chris Enlow, community relations manager for KEEN. Rock/Creek is especially pleased to work with KEEN and the Grassroots Outdoor Alliance on this initiative, since this cell of violent storms hit the Chattanooga area (most notably Ringgold, GA) particularly hard. We’ve pledged a minimum of $5,000 for the cause. You can purchase KEEN footwear online at rockcreek.com, or visit us locally at our North Shore and Hamilton Place locations.